Get up to date on the most commonly cited hospice deficiencies and solutions. This on-demand webinar will discuss the hospice interdisciplinary team (IDT) Conditions of Participation (CoPs). This webinar reviews the challenges and strategies associated with providing evidenced-based hospice education and training. 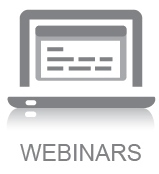 This on-demand webinar reviews the publicly reported Hospice Compare quality measures, including both the Hospice Item Set (HIS) and Consumer Assessment of Healthcare Providers and Systems (CAHPS) surveys. This webinar explores the key role your hospice physicians play in helping to face challenges.